There is an awesome buzz around Underberg as we gear up for the race and the whole FNB Drak Adventure Weekend! 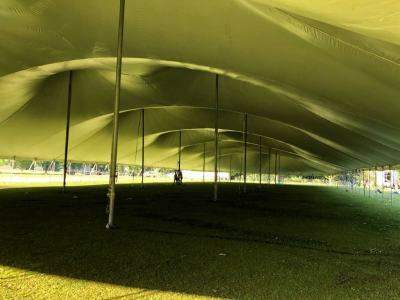 The marquee is up at the Underberg Country Club, ready for registration and the FNB Drak Music Experience concert on Saturday night. Entries are looking good (see here) and late entries close tomorrow night (Wednesday 16th) at midnight. Click here to get a late entry in. So what’s the river like? You always get a straight answer from us at the Drak! The river is low as the summer afternoon thunderstorms have somehow evaded the catchment area. We provide honest and accurate river updates every morning on our Facebook, Twitter and our Instagram accounts. The uMzimkhulu as measured at Castleburn and Scotstons bridges is low right now, and pretty much as it was for last year’s race and the recent FastDrak. There is rain forecast for almost every day this week, but we will have to see where it falls and what it does to the river. As we always do, a call will be made on Friday morning about the start and race course, and publicised on the race website, social media and another of these eNewsletters. No matter what, it will be a great weekend paddling in the uMzimkhulu valley. The great vibe at last year’s low-water race proved that the paddlers come to Underberg ready to have a good time and make the most of the conditions they find. We are offering a Boat Repair Centre for paddlers that need to fix their boats during the race. This will be open at the Underberg Country Club from 12h30 on Saturday afternoon. For those keen to do their own boat repairs there will be boat repair kits for sale as well. Remember that we are offering a super-handy Vehicle Shuttle Service, being run by the team from The Noah’s Ark Early Learning Centre. The service costs R150 a day and is a game-changer for any paddler that arrives in Underberg to race without a seconder! Bookings will be taken until Friday the 18th January. Pevensey Place will be selling pancakes at the finish of each day, and Faithways School will be providing delicious bacon-and-egg rolls for breakfast at the start. Paddlers should register for the race at the marquee at the Underberg Country Club between 2pm and 8pm on Friday, and collect their race garments. Round Table will be selling food, and a cash bar will be available, with Underberg local Hayden Rattray performing live on stage from 5pm to 6pm. There will be some of the previous year’s Drak merchandise available for purchase at awesome prices at registration, so make a plan to check out the range and see if they have your size. 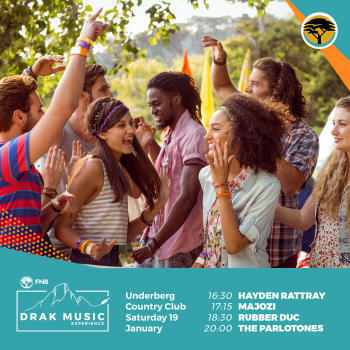 We are looking forward to seeing you at the FNB Drak Music Experience at the Underberg Country Club that starts at 4:30pm on Saturday afternoon with local Hayden Rattray, followed by Majozi, Rubber DUC and The Parlotones. Every paddler gets two free tickets to the gig. You can purchase extra tickets at WebTickets or at registration (2pm to 8pm on Friday night) or at the door on the day, if there are still tickets available! Find out more about the line-up, and the gig here. Remember we will do the draw for the first of the Kayak Centre K1s between the acts at the concert. You have to be there to win it! A DJ will play for the revellers on Saturday night after the concert. The second K1 gets given away at the prizegiving at the end of Day Two. Bring your best vibe to Underberg! We are watching the rain and the weather forecasts and will relay all the final decisions on the 2019 race, which is doubling as the KZN and SA K1 River Champs, on Friday! Keep doing your rain dance! Check out all the information on the Drak Adventure Weekend here.